Kristin Chenoweth, left, and Idina Menzel during the taping of "A Very Wicked Halloween" at the Marquis Theatre in New York, New York, on Oct. 16, 2018. Fifteen years ago, one of the top films in the land was "Finding Nemo" and Shania Twain played the Super Bowl halftime show. 50 Cent's "Get Rich or Die Tryin'" was a hit album and a couple of witches-to-be took over Broadway. The musical "Wicked" shook off some tepid reviews to roar into Broadway history and this Monday is celebrating its coming-of-age with a Halloween-themed NBC special starring its original stars Kristin Chenoweth and Idina Menzel, as well as Ariana Grande. "First of all, I can't believe it's been 15 years. I think it was yesterday. And yet it feels like it's been 15 years. So there's that I'm battling in my brain," says Chenoweth, laughing. "I just wanted to be in a show that someone would have heard of." Mission, accomplished: "Wicked" is Broadway's sixth longest running show and is regularly sold out, last week commanding a $120 average ticket. There is currently a North American tour, a West End production and another touring the United Kingdom. The ice cream company Ben & Jerry's has launched a special sandwich in its honor. The musical reimagines the relationship between the Good Witch of the North (Chenoweth) and the Wicked Witch of the East (Menzel), who were introduced in L. Frank Baum's "The Wonderful Wizard of Oz" and immortalized in a 1939 film adaptation. The songs by Stephen Schwartz include "Defying Gravity," ''Popular" and "For Good." 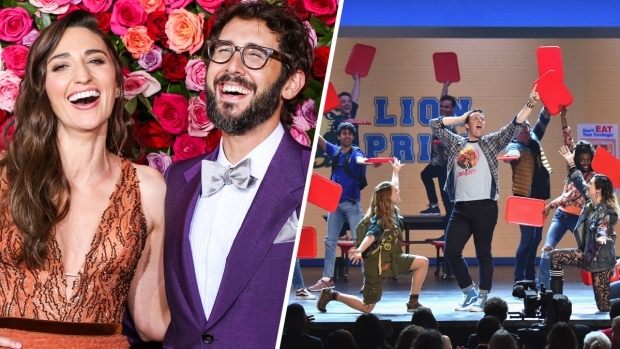 Critics were not always kind, with The New York Times sniffing that the musical "does not, alas, speak hopefully for the future of the Broadway musical." Variety called it "lumbering, overstuffed" and New York's Daily News described it as "an interminable show with no dramatic logic or emotional center." The musical premiered long before the #MeToo movement but has benefited from its focus on two young women — one seemingly perfect in looks and popularity, the other a restless, green-skinned outsider — finding their voices and forging a bond despite their differences. "It's a testament to the piece, to how good 'Wicked' is that 15 years later, it's even more important and really resonates with this movement that we're in. And how wonderful to have two female-centric characters who end up supporting each other and loving each other and changing each other and accepting in each other what makes them different and special," says Menzel. "It's also really timely because we have a voice right now and 'Wicked' is about not being ashamed to have that voice when it's powerful and even angry and fierce. We can't be afraid of how that will be perceived. We have to own that. Harnessing that kind of power is what really makes change and what true beauty is." Chenoweth agrees: "I love that 'Wicked' was done and such a success and that movies like 'Frozen' are done because it's a recurring theme to our new generation of girls — be strong, be courageous, stick up for who you are and what you are and what you believe." "I was really insecure. I hadn't worked in a little bit and so I was trying to find my process. I was competing and I was battling my own insecurities just like my character was." Menzel would win a Tony for the role. Chenoweth, a Tony- and Emmy Award-winner who would go on to have parts on "The West Wing," ''Glee" and NBC's "Hairspray Live!," remembers first getting a taste of "Wicked" when Schwartz asking her to stop by his Los Angeles home to hear him sing her "Popular." She adored it but made it her own by adding a little flip, making it "pop-u-lar." She insists she knew "Wicked" was going to be big. "I just remember thinking: 'This is so big. I feel this could be big. Like, I think this could be 'Cats,'" she says, laughing. "And I'll leave you with that."